The Green Room Café offers a variety of options including a salad bar, fruit and yogurt bar, grill, daily entrees, and Grab-N-Go items. 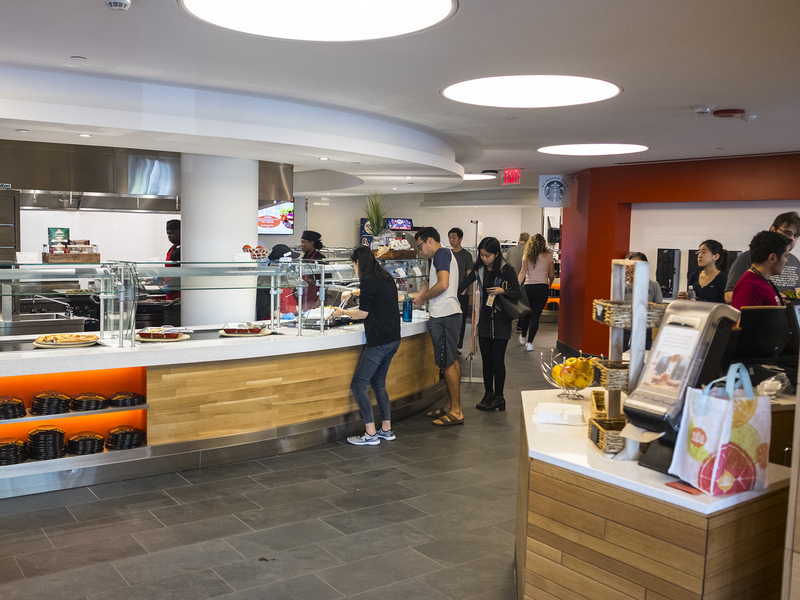 The Green Room Café is the on-campus dining hall located on the first floor of the Student Life and Performance Center catered by ARAMARK Campus Services. For those with gluten, nut, shellfish or other severe food allergies, accommodations can be made. Please notify Dining Services staff of your allergies in advance. Off-campus students, faculty, staff, and visitors can pay with cash, credit card or Penguin Pass by loading their IDs with Cold Cash or Cafe cash. What’s cooking in the Green Room Café? Find out what's on today's menu at the Green Room Café, located on the ground floor of NEC's new Student Life and Performance Center. All resident students are required to participate in the meal plan program. Funds are included in room and board pricing. Each resident’s Penguin Pass is loaded with $1,250.00 in Café Cash per semester ($2,500 for the academic year). Café Cash works like a declining balance bank account and can only be used in the Green Room Café. Funds are automatically deducted from students' Café Cash balance by swiping their Penguin Pass at the register. At the end of the fall semester, any remaining Café Cash balance will roll over to the spring. Please note that Café Cash may not be rolled over from the end of the spring semester to the following academic year. In addition to Café Cash, all NEC students may load Cold Cash onto their Penguin Pass, which can be spent in the Green Room Café, the laundry machines in the Residence Hall (for residents only), and for copying and printing on campus. Students can view Penguin Pass transactions, account balances, and add additional Cold Cash online. NEC faculty, staff and students can now add Café Cash to their Penguin Pass ID Card and get up to a 20% bonus in the Green Room Café. Café Cash can only be used in NEC’s Green Room Café and can not be increased. Cold Cash can be added to a Penguin Pass and can also be used for laundry and other services. Café Cash is added to your Penguin Pass as soon as payment is received.